I had a recipe planned for this post that I was super excited for. I waited all day for my yummy dinner to cook in the crock pot, I texted my husband saying he was in for a delicious dinner, and I was skipping with glee. That was, well, until I tasted it. Waves of nausea flew through my body. It was completely and utterly disgusting. Not only did I not have a backup plan for dinner, I didn't have a back up post to share! Because I am trying to save money, I choked down that crockpot disaster and called it a night. As for my post, thankfully my husband had to run to the store to get a few things. 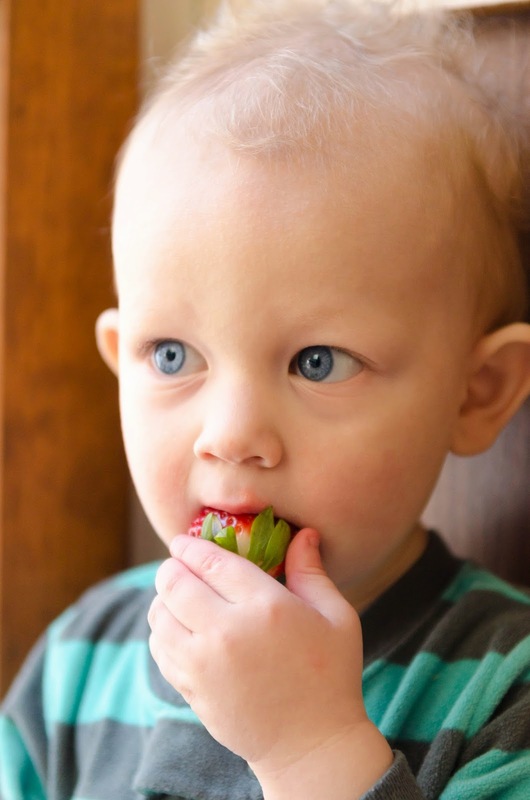 One of those things were strawberries since Bub's had eaten all of them and was begging for more! One thing I hate more than my fruit going bad before I can eat it, is throwing it in the trash and seeing it magically turn into cash floating deep into that unscented Hefty bag. I knew there had to be a better way. I didn't want to only buy small quantities since Bub's eats his weight in fruit and I didn't feel like replenishing my fridge every few days. Recently I have started to ditch storing food in plastic and have turned to glass. 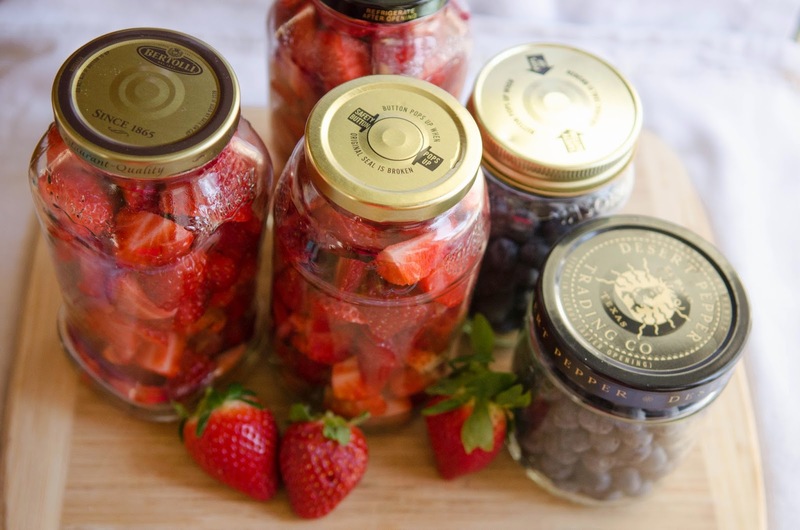 So I figured, why not ditch those slotted plastic boxes that the berries come in and store them in mason jars!? BINGO! No more fruit going bad after half a second in the fridge and now I don't have to cut them each and every time my son wants fruit! Win Win! 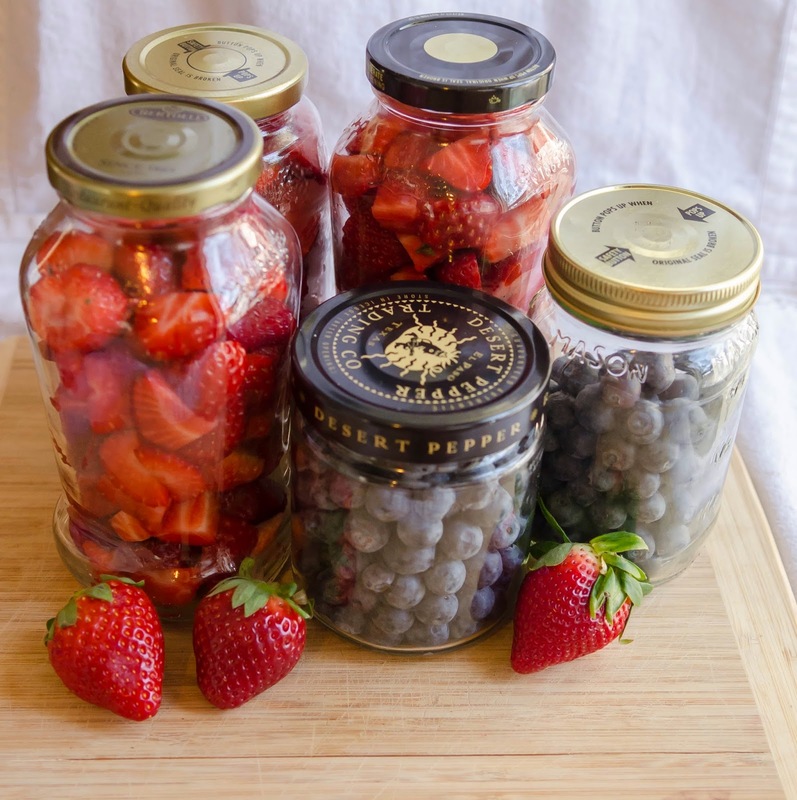 Storing fruit in mason jars, or the like, since they are expensive, will extend the life of your fruit upwards of 3 weeks. Yup you heard it! Fresh cut fruit for 3 weeks! Before you start to jar them you must wash them. You don't know who has touched them or what they have touched. So do yourself and your family a favor and run them under some water. Then you'll want to pat them dry. Wouldn't want that cute hand to get germs from who knows where! The strawberries were very tempting to Bub's when I was getting photos of them that he literally snuck his hand between my camera and the berries an grabbed one (photo above). After rinsing them off you want to slice the tops off then cut them into bite sized pieces. Make sure your shaking the jar so they settle down to the bottom. 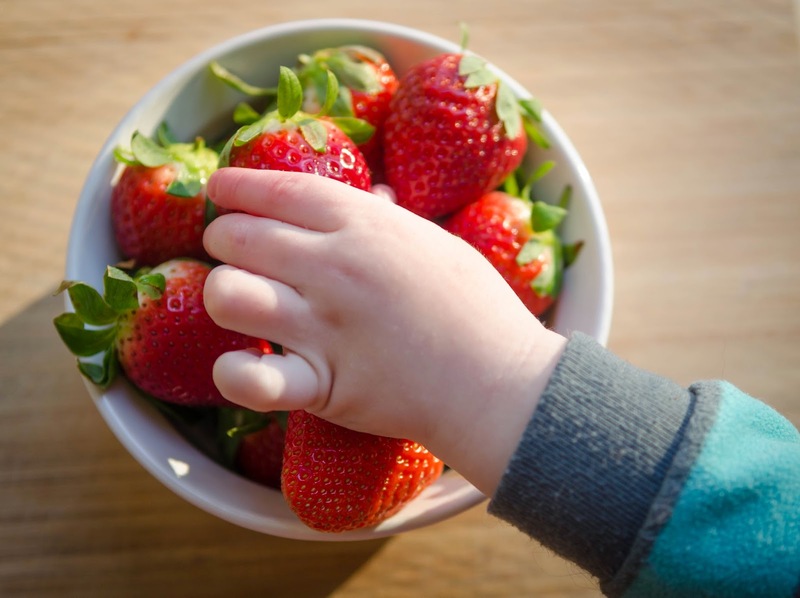 If you see any fruit that has already gone bad before you start, just toss it. Remember, one bad fruit can spoil the entire lot. So you can either eat it if it looks like it's going to turn or just ditch it if it's too far gone. You might have noticed that I didn't use actual Mason Jars. They are expensive and I had so many random jars kicking around the house. 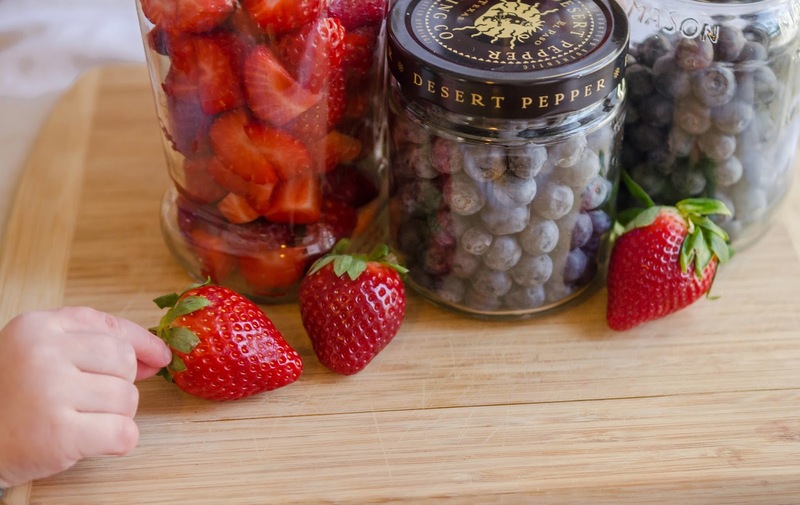 Feel free to use old pasta sauce jars, salsa jars, or any other glass jar with a lid. And an easy way to wash them out is to use a baby bottle brush. I have a few in the house, but if you don't they only cost a few bucks and it's worth it. You can really get in there. 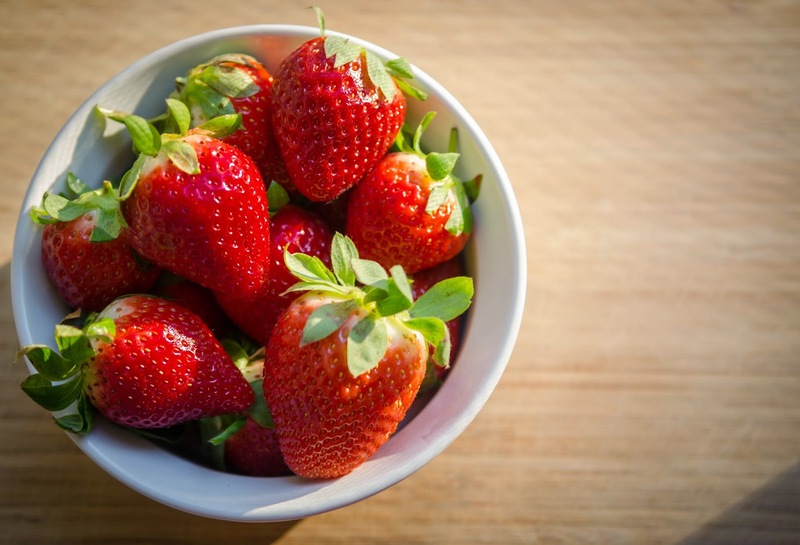 If they aren't super clean then your fruit will take on the taste of the previous substance that was in the jar. Store them in the fridge and enjoy for the next few weeks!! This works wonders for strawberries, blueberries, blackberries, raspberries, lettuce, green peppers, ect. 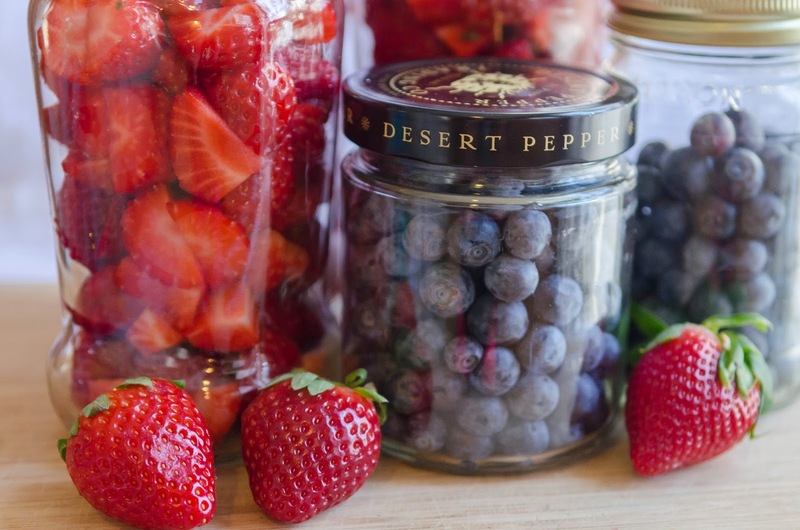 If you can cut it up and fit it in the jar, then you can save it! What a great idea!! 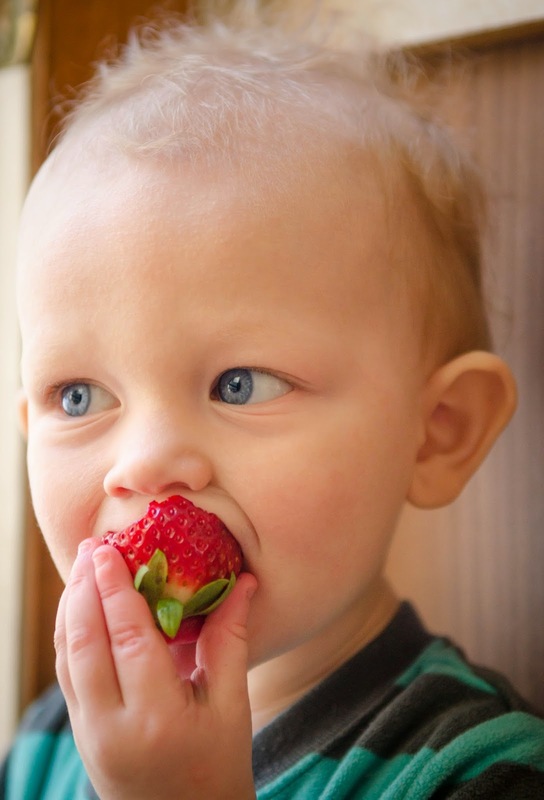 Adri goes through berries like crazy! I have a ton of jars sitting around too! Oh then you've got to try this!! I hate when you get the berries, one has gone bad, then they all start to go bad. And this way, they are all pre-cut for your cutie! Great idea & a great post! I'm visiting from TGIF Blog & Instagram hop. I'll have to try this, especially with strawberries. My boys never want to wait around for them to be washed and de-stemmed (like they couldn't do it themselves!). found you on Wine'd Down Wednesdays. Does this work for all fruits and all veggies? I've been buying precut fruits and veggies which spoil very quickly.